Many top network gear makers have Facebook pages, but it won’t be a surprise if some of them might decide to un-friend the social media giant after they find out that Facebook has been building its own network equipment. At the Networking @Scale event at its Menlo Park, Calif. headquarters, Facebook showed off Six Pack, a networking switch developed by the company’s own engineers. Six Pack is made up of six hot-swappable modules. This latest component of the Facebook data centre enables IT equipment in the facility to talk to each other. 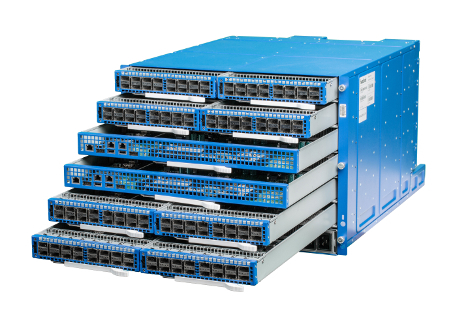 Its seven-rack chassis includes eight 16-port Wedge switches and two fabric cards. The equipment’s ports are 40 Gigabit Ethernet. Top-of-the rack switches aggregate connectivity in the racks and Six Packs interconnects all top-of-rack switches. Six Pack makes the network more scalable compared to the traditional approach which was to build several big server clusters in a data centre and connect them, Yuval Bachar, hardware engineer at Facebook, told Data Centre Knowledge. Six Pack relies on Facebook’s Wedge switch, which the company also develop. Six Pack could be potential competition for products offered by network gear vendors like Cisco and Juniper. Six Pack appears to be easier to expand, cheaper to build and not closely coupled with network software. Facebook is planning to make the Six Pack design available to the public through the Open Compute Project, the company’s open source hardware and data centre design project. When this happens, data centre operators and vendors will be able to use the Six Pack design to build their own switches and network fabrics.